World War two unit histories are an unfair category of military history, with the shelves dominated by the German SS, Panzer and US Airborne units. The English language historiography of the Great Patriotic War has expanded over the past decade with Russian language authors providing fresh perspectives through operational histories, memoirs and battle studies. However, until now, no Soviet unit histories have joined that expanded historiography. Luckily, that has now been rectified with this fine history of the 2nd Guards Tank Army. This book covers from the unit’s origins up through the fighting in Romania in early June 1944. Much of the format will be familiar to those that have read other World War 2 unit histories. Each operation the unit participated in has it’s own chapter, starting with an overview of the command structure, followed by an assessment of the equipment, supply and training of the Army. After that, a concept of operations is given (what they wanted to have happen) and an operational narrative of what actually did happen. Each chapter then ends with an assessment of the operation, selected veteran’s recollections, excerpts of subordinate unit histories and a list of soldiers who won commendations with a brief description of the actions that won them the award. So, other than the fact that this covers a Soviet unit, how does it stack up? Pretty damn well, as it turns out. First, for anyone worried that this is simply some Russian biased account using only Russian sources, rest assured that is not the case. The author cites modern Western historiography to assess what the tactical situation was for the German units fighting 2nd Guards Tank Army during its operations. For the most part, the narrative feels balanced albeit from a Soviet point of view. When the author disagrees with a Western account, he is specific about what and why, citing primary documents to buttress his conclusions. Second, the book contains numerous primary documents from 2nd Guards Tank Army, including internal performance assessments, periodic strength returns broken down by tank type, losses broken down by tank type and severity, and original operations orders. This is an absolute gold mine if you are attempting to independently assess how the combat went, particularly when the author is critical of the existing historical narrative. Korsun Pocket and Targu Frumos are examples of this in the book that made me go look at the existing literature. Finally, the operational narratives are pretty good and the maps in the book make it reasonably easy to follow the action. My only complaint with the maps is that there aren’t quite enough of them, as I found myself looking for place names on Google maps then following the action that way at several times. This was particularly true of the fighting in Romania towards the end of the book. 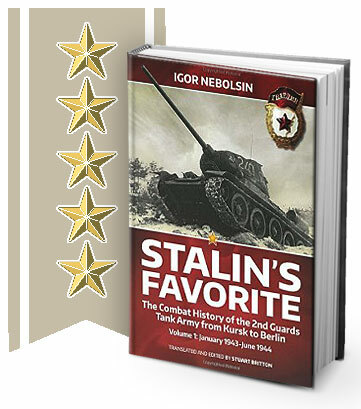 Overall, this is a book you should definitely have if you are a student of the Great Patriotic War. It’s as factual as any German unit history I’ve ever read and far more rigorously supported by modern scholarship. I highly recommend it and would give it five stars! Thank you very much for purchasing the book and the honest and interesting review of it. Highly appreciated! I hope you will enjoy Volume 2 as well which should be released soon. Thanks for stopping by and reading my review! I’m really looking forward to reading Volume 2. Hopefully it will be out soon (It’s listed as a March 19th release on Amazon), but Helion often has release dates slip a bit. PLEASE write more of these unit histories! I have written two more unit histories both in 2 volumes (1-st Guards Tank Army and 6th Guards Tank Army). First one should be published in Russia in April 2016. Second one I will publish privately in May-June 2016. Helion Press hopefully will be able to translate the first volume of 1st Guards Tank Army combat history in 2017. Unfortunately translation from Russian into English takes very long time and I depend here on the translation capacity of Helion Press.